Creating a compelling product vision is a difficult task, even more challenging is to sell the created vision. The balance between an innovative and sellable vision is elusive. 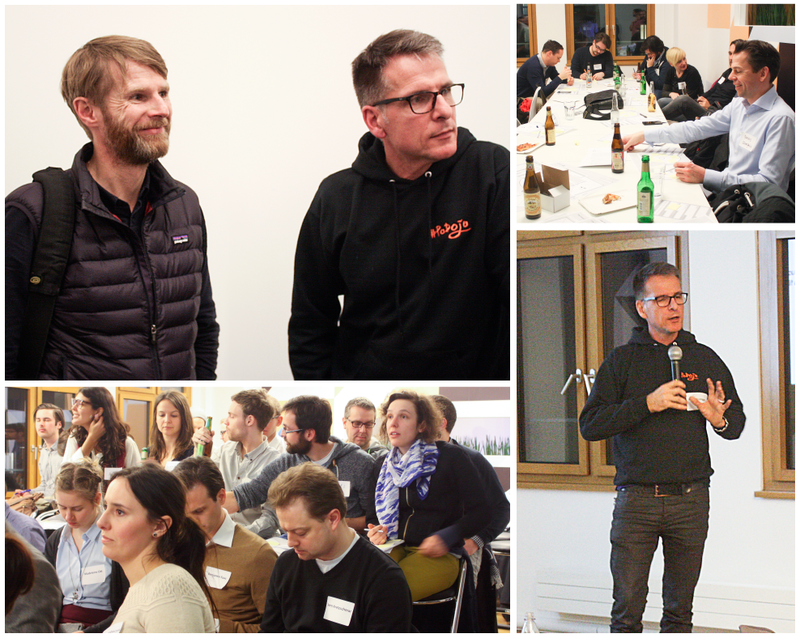 “How to create and sell a great vision” was the topic of the sixth Product Tank Berlin meetup which took place at Fyber last week. After the presentations, we had the honour of chatting to two great coaches of Design Thinking and innovation, Jens Otto Lange and Stefan Haas, and asked them about incorporating Design Thinking ideas into the product management and daily workflow of a tech company. Both have great experience and knowledge of agile methodologies and facilitate co-creation workshops to train teams on their thorny path of digital innovation and product creation. The blogs of Jens and Stefan are full of useful information about agile product creation and make for an educational and fascinating read. So first of all, for those who have never heard of Design Thinking, could you explain how you would suggest to apply these methods in the real world, in the day-to-day operations of a company? I know, for example, you have this room here in your company, it’s a creative space without desks, and this different environment causes another mode of working. The room is one of the three main factors of success, it’s the physical environment. You should create these varied kinds of environments in your daily business. The other important factor is changing the culture so that the corporate culture is favourable to incorporating this mode of thinking into daily routine. Creating a room is not that hard, it’s much more about creating a mental room. We organised a creative room at our own office. Firstly, we evaluated and discussed what we wanted in the room, and what we wanted to see left out. This really created a working groove over a few days. It was really fascinating to see, when we opened it up again in the end to the rest of the office and held a presentation – well, it went horrible. They expected finished shiny prototypes, but instead were shown postits and scribble notes and flip charts. One of the team members went to the list and demonstrated it to the team, our mental room description. To construct the creative space favoring innovation you don’t need much architecture, only a sheet where you write down things that you can relate back to. It’s that easy – with simple tools from an office supply shop you can build a room for more creativity. Another thing of course is that you have some people on the team that are trained, that can facilitate these kinds of meetings and train the others. The basic thing here is to open your mind to new options and possibilities and then close your mind again, be aware of the new options, then open, close, etc. People who are trained towards a certain mindset are needed to promote these methods within the team. You talked a lot about mindset, is there something about organizational structures that you think needs to change or be adapted to allow for this? Design Thinking is based on three factors: the room, the process, the team – and furthermore, a team that is cross-functional. In big companies it’s often the case that people have to get permission to work together across functions or departments and resources must be available – so one day of work together, it might have to be planned months in advance. This limits the kind of work possible because when you only work with people from your own department, you get no new perspectives or new ideas because you are always stuck in your own project. When you want to be innovative and fast, you want a quick feedback cycle. The decision path has to be shorter and to shortcut that path you have to make changes in your organization. Evaluate how long the distance is from you to the customer who provides final feedback on the product. If that path is long, then you have to start experimenting and changing things. That’s why we work with cross-functional teams in the sprint, because there has to be a very close connection between general strategic decisions and final designs. There should be a balance between the strategic level decision makers using tools such as “proposition canvas tool” and the people working on the product and the tangible prototype of the final product. There must be an iteration of the product with input from both levels. When you take the sprint method, it shortcuts the horizontal making a cross functional team for the building process. What we further added to that is having the strategic dimension, which is dependant on the hierarchy in the organization. Having more people who are making strategic decisions part of the group. This way you have two feedback cycles; one going in one direction and the other in the opposite. You mention the strategic level and the day-to-day operations. Is there a specific cadence of how to make use of these tools? How do we get from the vision that we thought up in a week long workshop to really making use of it on an ongoing basis? There are different ways of doing this and there is still a discussion about which way is the best, but of course you should make it a sustainable part of how you work. Different companies do it in different ways. Some do these kind of sprints every week, then every four sprints they do an innovation week and work with new ideas and try to push something into the development cycle. Others try this dual-track setting where they have an innovation or a product team working two sprints ahead of the production team. All of these setups have benefits and have problems, but they do try to make a sustainable ongoing activity of innovation. We strongly recommend to these companies to implement some testing cycles which facilitate the move from more qualitative testing to data-driven testing, because now they can execute the idea in a sprint and see whether it works or not while the idea is still just a hypothesis. It’s crucial to implement this test-driven innovation cycle in your company, because without it you’ll lose your path again. When you’re conducting these workshops, how do you guarantee or facilitate buy-in from stakeholders that were not part of the workshop? For example, those that didn’t see all of the ideas that were voiced at the workshop but didn’t make it to the final presentation? We’re pretty sure that you don’t get buy-in unless people are really convinced. If the stakeholders are not part of the creation process, they miss the story. They have no clue what is behind this little paper prototype, they can’t relate to the experiences, they haven’t been outside of the building doing interviews. Even as part of the creation team, some people go outside to conduct the interview and some stay. Those who stay in the room do not have first-hand experience, they have to join. I know companies where every single person has to do interviews. One thing we recommend is to set up a regular user testing lab. It’s something that’s very cheap and easy to do. Every week for an hour, invite users to the office. You can either do a proper interview or show them fun usability tests. Your customers are right there, so make use of that. It has a huge impact. If management is not part of the innovation or creation process, the workshops are a good way of making them a part of it. Maybe not five days, it can be a shorter thing. The only constraint I found here was the hierarchy and the understanding of one’s role. I found it easier to put managers into a team together, instead of mixing them up with employees of other hierarchical levels. When you mix the levels up, you can observe that some managers push their ideas quite strongly and the workshop is less productive. What do you think is the best way of getting used to using these methodologies if you weren’t part of this school? For example, if someone says: “I have no idea about Design Thinking, but I’ve heard about it and I think it sounds great. I’d like to make use of these methodologies at my company or in my work “. Our team counts on a mix of training and applying the tools. You should experience the methodologies in two key focus areas: The first being training and the second being problem solving. The best way to learn these tools is to experience them through application in your specific context. Otherwise you’ll have the tools in place, do a nice setup exercise, and then come back thinking, “how will I match this with what I do?” So it’s best, when people come to the workshops with their own challenges in mind, to learn how to solve these issues while they train with the tools. We follow two paths. One is taking people out of their job context and having some tool training through simulation and games. However, then they can have a hard time transferring what they learned into their daily job. I think what’s more effective is using an action learning style. People get to solve a problem that they’re experiencing in their job, at the same time that they’re learning more about the tool. Is there a favorite introductory tool or workshop technique that gets people excited about Design Thinking methods? And what would you suggest for people who don’t have the time or money to spend on proper training, but just want to find out if this is something for them? Participate in a Service Design Jam! It’s a global activity, like the Product Tank, and it takes place for an entire weekend twice a year. There are all kinds of locations where you can participate in this creative workshop. The next one is at the end of the month in Berlin, and it’s a volunteer activity where anyone can join and carry out a design thinking process to develop services. The methodology is Design Thinking and it’s a really easy way to practice and get into the methodology, while having fun. What would be something that four to five product guys in a company could implement, without knowing all the in-depth methods Design Thinking offers? I think the easiest and most fun way is when you start prototyping. Bring in clay or Legos and spend half an hour prototyping. That moves your mind from the more rational to the productive and intuitive thinking mode and you’ll explore new space in thinking. So prototyping is the first thing I would introduce. The basic idea is to first define your problem and then define your solution. Always think in options and then come to a decision. Another helpful method is working with tangible things – for example, drawing the problem instead of writing it down. My basic premise is to introduce intuition into the business again and not to rely only on rational deductive thinking. Rather, bring some emotion into what you do. Start incorporating things that give you a more holistic view, like drawing, observing people, or analyzing bits of data from different interviews. On the whole observation and user interview topic: It works great for companies that are consumer-focused. Do you have tips for companies whose customers are other businesses? You can’t easily bring them into your offices, for example. One way is indirect. Bring in salespeople who speak to customers and make them your interview partners. Another way is to just select a few customers and have a phone call or Skype call with them. If you already have an established B2B customer base, just visit them or organize user groups – many software companies do that to create a forum for discussion.